The White Goddess; a historical grammar of poetic myth. 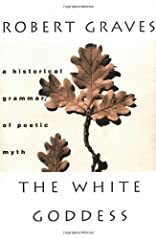 THE WHITE GODDESS: A HISTORICAL GRAMMAR OF POETIC MYTH. The White Goddess-a Historical Investigation was written by Robert Graves. The White Goddess-a Historical Investigation was published by Farrar Straus & Giroux. About Robert Graves (Author) : Robert Graves is a published author of young adult books. Some of the published credits of Robert Graves include Proceed Sergeant Lamb, I Claudius, Fairies and Fusiliers. The book content is really impressive and I couldn’t understand the inside message of this book. Could you please share the reviews on http://college-paper-writing-service.reviews/writemypaper4me-reviews/ of this book. I am sure it will help me to understand the story of this book. Thank you in advance.